I haven’t read as many books as I wanted to this year, but I want to share some of my favorites with you. Here are six of the best books that I’ve read in 2016. I hope that one of these books will inspire you to read, or intrigue you enough to visit a library or bookstore. * “Passenger” by Alexandra Bracken – about finding out who you really are, choosing your future, refusing to conform to society’s expectations, power that corrupts, and opening yourself to possibilities. * “Empire of Storms” by Sarah J. Maas – about power and responsibility, loyalty- self-sacrifice, creating a better world, and love making you into the best possible version of yourself. * “Dark Matter” by Blake Crouch – about our choices changing the future, family vs. career, alternative realities (“every thought we have, ever choice we could possibly make, branches into a new world”), the act of observation determining reality (“what a strange thing to consider imagining a world into being with nothing but words, intention, and desire”), and the idea that identities are fluid and multifaceted. * “Move Your Bus: An Extraordinary New Approach to Accelerating Success in Work and Life” (2015) by Ron Clark – about sprinting to success, rewarding top performers, and motivating everyone to contribute more. * “Furiously Happy: A Funny Book About Horrible Things” (2015) by Jenny Lawson – about choosing to be vehemently happy with depression and mental illness, taxidermied raccoons with big grins and jazz hands, and midnight cat rodeos. Which books have made an impact on your life? Which books comfort you and inspire you? It’s easy to get caught up in the latest toy craze, to hunt for that “must have” gift. During the holidays, we are often bombarded with Holiday Toy Lists and Hot Toys of the Year. We are told what toys are popular and which will be the hardest to find, so buy it now. But in my opinion, board games and card games are still the best family time activities – better than movies and video games, where we stare at the screen instead of pay attention to each other. So I wanted to share some of the all-time favorite games that my family enjoys. There are no flashing lights, CGI, or robots, but these games don’t need it. 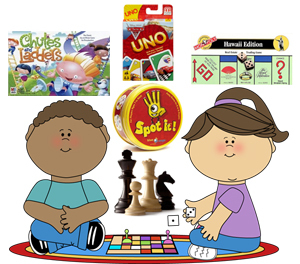 * Chutes and Ladders (preschool). I remember playing it when I was a kid, and I introduced it to my son. Even as an adult, I chant the number I need to roll to reach a ladder or avoid a chute. The game is pure luck, and not really competing against other players – you’re racing against the game to avoid the chutes and land on the ladders. * Uno. In our family, it was Cars® Uno, a Crazy-8s card game on steroids. My son loved the bright colors, the quick-changing cards, and collected wildcards (he hoarded them like gold). You have to pay attention to the game, with all the color changes, reversals, and skip turns. * Spot It. This is a wonderfully clever and ingenious card game that I discovered when my son was in elementary school. It really is mind-boggling. Every card has exactly ONE picture match with every other card in the deck. Our family played a lot of Spot It, including the “On the Road” and “Words” (with Disney® Pixar® words and characters) versions. We play tough – you have to say the matched object out loud (no finger-pointing allowed). * Monopoly. We started with Cars® Monopoly, spinning for race car “properties,” but now we’re hooked on the classic Hawaii Edition, with properties like Ala Moana Center, Aloha Airlines, and the Royal Hawaiian Hotel. It’s about strategic buying, deal-making, and the strange realization that jail is often the safest place to be when the board is filled with houses and hotels. * Chess. Technically, this is not one my favorite games, but my husband and son really enjoy it. And I enjoy reading a good book while they play. Shh, don’t tell: for the holidays, I’m going to introduce Would You Rather?, a card game that asks you to choose between two options. There’s no changing the question or qualifying the answer. For parents with young children, The Measured Mom came up with her own “Would You Rather Question Cards” that is free and downloadable for personal and classroom use. What toys did you play with as a kid? What toys do you enjoy playing with kids? I love to collect holiday ornaments to commemorate important events in our lives. I have a house ornament for our first home, dog house to welcome our dog, a stroller for our son’s birthday, a schoolhouse for his first day of preschool. During the holidays, I would carefully hang them on our tree, and think about the memories associated with each ornament. 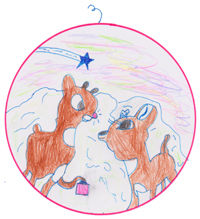 But as the number of ornaments grew, I felt unhappy that all of the ornaments – and memories – were jumbled on the tree. This year, I decided to create an ornament board so that I could display all of my commemorative ornaments and even write a short note about the event. It took me three days to complete my commemorative ornament display. I bought a 4’x8’ piece of hardboard from a hardware store, and cut it to a more manageable 4’x5.5’ size. 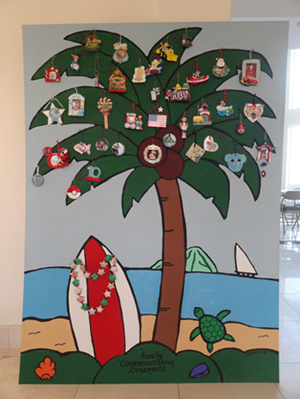 I painted a tropical scene with a coconut tree on the beach (not a snowy mountain scene – this is Hawaii, after all). Then I hung the ornaments in chronological order along the tree leaves. Not every ornament made it on the tree, but I chose the ones that had special meaning to me. I put the ornament display right next to our tree, which my 10-year old son decorated himself this year. He hung up ornaments with their own stories – ornaments that he made, that people gave to us, that are eclectic bits from other gifts and packaging. Now when I look at these ornaments, I can reminisce about the stories of our lives, and feel grateful for our memories and time together. Do you collect commemorative ornaments? Do you have a favorite holiday ornament? Earlier this year, my mother received a surprise package in the mail: two books written by her older cousin, Akinori Imai, an electrician, teacher, and lay minister. This is his story, written at age 81, from his childhood through age 17. 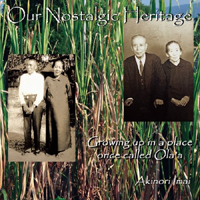 “Our Nostalgic Heritage: Growing Up in a Place Once Called Ola’a” (2012) is a memoir about Akinori Imai’s personal experiences, childhood memories, and family history as the son of Japanese immigrants. It is a wonderful glimpse into the Japanese immigrant plantation experience, and a nostalgic look at the plantation town of Ola‘a on Hawai‘i Island. Imai was born in 1928 to Masayoshi and Hisayo Imai, and lived with his paternal grandparents Toyoji and Kii Imai and 8 siblings. He made frequent trips to Wailea to visit his maternal grandparents, Gosaku and Motoyo Nishiyama, and his Aunty Ayako Hamada, often traveling alone. During those trips to Wailea, he spent time with Aunty Ayako’s eldest son Kazumi – fishing, swimming, and picking mango and mountain apple. He and his friends, especially best friend George Fujiwara, made their own tops, kites, wooden boats, kama pio games, and squirt guns (from African tulip tree pods), and enjoyed sliding naked down the sugar cane water flume. The Ola’a Sugar Company’s “9 Mile Camp” was divided into two camps, mainly Japanese and Filipino immigrant workers. The workers were frugal and resourceful, and nothing was wasted. Imai reminisces that for toilet paper, families used fruit wrappings, newspaper, and catalog pages from Sears Roebuck or Montgomery Ward. Ceiling materials were often made of bleached rice bags stitched together. In the 1930,s gasoline was 20 cents per gallon, blocks of ice were 10 cents and 15 cents, candy bars were 5 cents, and school lunches were 10 cents. Imai was 13 years old when Pearl Harbor was bombed, and war reached their remote town. On December 7, 1941, his grandfather Toyoji Imai was arrested and spent the war at an internment camp in Santa Fe, New Mexico. In Ola’a, martial law was imposed, with a curfew and complete blackout. Residents had to carry their ID papers and gas masks. There was rationing for rice and gas. Imai’s parents lost their teaching jobs, so the family planted a garden and offered laundry services for soldiers. In those years, children took on more responsibilities at a younger age. By age 14, Imai worked in the sugar cane fields for 12.5 cents per hour. At age 15, he worked at a lauhala processing and weaving company in Hilo. He took a summer job at the California Packing Corporation, picking pineapples at Camp Kunia on Oahu. Two years later, he boarded an interisland steamship “Waialeale” with $25 in his pocket and a leather luggage to work in Honolulu. With his uncle’s help, he worked as an electrician’s helper for 65 cents per hour, and 4 months later was hired by the American Electric Company for $1.10 per hour. His narrative ends with the 1946 tsunami on April 1 that devastated Hilo. I enjoyed the short anecdotes about Imai’s youth and the many historic and personal photos that bring his story to life. I respect his family’s strong bonds and the way that they took care of each other, even though by today’s standards they didn’t have much. And I am delighted by glimpses of my grandfather – and great-grandparents and a connection to a place that I have never visited. You are currently browsing the Better Hawaii weblog archives for December 2016.